Artificial intelligence has received an extraordinary amount of hype from the media. Hollywood in particular has pushed a dystopian view—it’s science fiction that has an awful lot of fiction in the science. We are heading into an era where we’ll be increasingly interfacing with artificial intelligence—as robots, machines, drones, self-driving cars, chatbots, etc. And because of the media’s AI hype, many people fear this future. At Soul Machines, we think that people will be more comfortable interacting with AI if these systems are actually more like us—if we can interact with these systems in natural ways, and over time, learn to trust and comfortably engage with them. That’s why we’ve focused on creating digital humans. 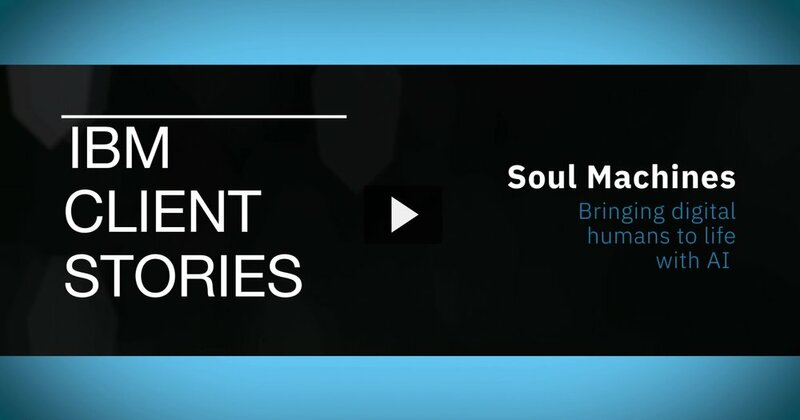 Soul Machines is a ground-breaking high-tech company of AI researchers, neuroscientists, psychologists, artists and innovative thinkers. Our mission is to reimagine how people connect with machines by creating incredibly life-like, emotionally responsive artificial humans with personality and character. My business partner, Dr. Mark Sagar, has spent his life studying the human face. He won two Academy Awards for the incredible work he did on movies like Avatar, with James Cameron, and King Kong with Peter Jackson. Building on his expertise, we’ve added AI to create a virtual nervous system that is made up of neural networks and machine learning—in effect, we’ve developed biologically-inspired models of different parts of the human brain. To date, we’ve used this core technology to create AI systems—like Baby X and Rachel—that serve as a user interface to an AI platform. Our core technology, or Human Computing Engine, sits on top of IBM Watson and uses Watson Assistant (formerly Watson Conversation) as a key part of our dialog interface. The AI systems we create can be used on flat screens—like your smartphone or laptop—but can also be directly inserted into augmented reality (AR) or virtual reality (VR) environments. Since we build these systems in 3D, they can be projected as holographs without any further work. The applications for these humanized AI systems are endless. For example, we’ve got a worldwide shortage of science teachers in our high schools. We can create digital tutors that can help kids get specialized knowledge about physics and chemistry as they do their homework. Doctors congregate in bigger cities where there are more people who can keep their practices functioning. As a result, rural and remote areas can find it difficult to provide adequate healthcare services. With our technology, we can create virtual doctors to ensure that these communities get the healthcare they need. And that’s just the beginning. We’re about to start a project that will bring somebody who’s been dead for a couple hundred years back to life, so that they can talk about their work and their inspiration. With humanized AI systems, we can tell their life stories in a way that hasn’t been possible before. That’s the wonderful thing about what I get to do for a living… it’s an incredibly creative world, limited only by our imagination. NEWS: We are one of the 2018 Tech Pioneers!